Where to Play Magic Love for Real Money? NetEnt are making a name for themselves when it comes to making incredibly simple online slots, that manage to retain huge levels of excitement. Magic Love is certainly one of these, and it will appeal to those looking for a simple way to play their favourite type of game at online casinos. As the name suggests, the theme of this slot is the magical world of love, however it doesn’t have much of an impact on the game, as there are no love themed bonuses or features for players to enjoy from time to time. This only adds to the refreshing simplicity though, which will appeal to many different online slots players. 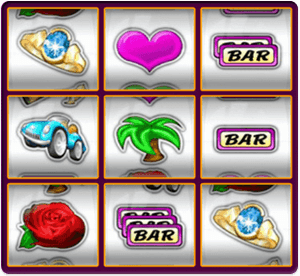 The only way in which players know that this slot is about love is through the symbols, with some featuring romantic graphics. These include roses, hearts and bottles of champagne. More classic symbols are also featured, such as BARs. Usually this inclusion of standard symbols is just laziness on the part of the slot producer, however at Magic Love it really helps to ensure that the slot keeps its connection with the classic slots of the past. So, if you enjoy simple slots, you should really enjoy playing Magic Love from NetEnt. How to Play Magic Love Casino Game? The gameplay at Magic Love is incredibly easy. In fact, it is so easy that even a complete novice will be able to get the hang of this slot within seconds. It features just three reels, which is one of the main reasons why this slot retains its simplicity, while the simplicity is further enhanced by the lack of bonuses – all of the action takes place on the reels, with no second screens to distract players. One slight variation it has when compared to classic slots is the fact that it has eight paylines, which run not only horizontally, but also vertically and diagonally as well. This might annoy real slot purists, but most will find it enhances the gameplay. To start the game, you’ll first need to choose how many of the paylines you want to play, remembering that the more you choose, the more chances you have of spinning in a win. You can also choose how much to bet per payline, which can range from 0.10 coins through to 1.60 coins. This maximum bet might not be enough for some players, but it should be more than enough for the vast majority of slot players, who want to play at more modest limits. If you’ve been playing slots for a long time, you’re probably used to the massive amounts of different bonuses and features they usually offer. In fact, you might even expect them from an online slot nowadays, and look down on slots that don’t feature them. Magic Love proves that this could be a mistake though, as it shows that bonuses aren’t needed in order to produce a slot that is exciting and fun to play. Of course, some will disagree with this, but there are loads of bonus-laden slots out there that they can play at! When deciding on whether to play Magic Love, ask yourself this one question – what is the most important thing a slot can provide? The answer will almost certainly be the chance to win money, and Magic Love certainly gives players this opportunity. The jackpot amount might not be as high as some other slots, but it’s the regularity of the smaller wins that should excite players most. This is how slot machines used to be, back in their heyday, and this should really appeal to many players looking to reminisce. Of course, there are a couple of special features at this slot though, and the first of these has already been mentioned – the fact that the paylines run horizontally, vertically and diagonally. There’s also the fact that big prizes are on offer to players able to get the same symbol covering all of the reels. These add some extra excitement to this online slot, without taking away from the classic feel that it has. So, if you are the kind of player who values wins over features, this slot could well be a great choice for you. Why not head to your favorite online casino and have a few spins at Magic Love today?